Use Blackhole For Gophers, Rats, and Moles. 1. Lightly “prime” blackhole trap with loose soil to conceal cable noose and floor of trap. 2. Find a fresh gopher or mole mound. Dig up and expose open tunnel. In lawns, carefully spade up a rectangular piece of sod and save to cover hole once rodent is caught. 3. Install blackhole trap in tunnel opening and seal all cracks with loose soil to insure no light enters. 4. Keep vent hole in the back end of the trap clear of soil to allow air to enter. a. Trap improperly set in tunnel. b. Light leakage into trap. c. Trap too “stiff.” Readjust trigger for tripping with just a slight touch. d. Maybe you have a smart gopher. If packing persists, stick a carrot in the vent hole and reset trap. Let’s see how smart he is! 1. Lay blackhole trap on flat surface. 2. With left hand, depress spring down flush with top of trap and hold down. 3. With tight hand, lay “spring bar” across spring and insert end in “trigger bar” across spring and insert end in “trigger” hold. Gently release. 4. The trap is now set and ready to install in gopher tunnel. 1. Trap evening and early morning. 2. Cover gopher & mole trap with loose soil, sealing all light except vent hole on end. 3. Wash blackhole trap with water after use. 4. Set gopher & mole trap in fresh tunnel only. If no activity in a few hours, move trap. 1. Set trap as per gopher instructions. 2. 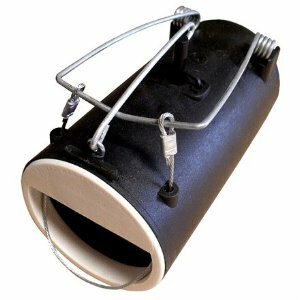 Drop bait through vent hole in rear of trap, keeping bait behind trigger grid. Sprinkle a small amount of bait at the mouth of the trap to entice rats. For bait, use corn, nuts, seeds, grain, bread crumbs, peanut butter, etc.